The lost art of informative illustration. In the 1940’s I had a kids-level encyclopedia called the Book of Knowledge. It had articles much the same as the ones you describe in the New Wonder book. I wonder if the one was a single-volume version of the other. Check out a “reader” used by American frontier schoolkids in the late 1800’s and early 1900’s. You can sometimes find these in the small mining town museums of fly-over states. The reader was what the teacher taught from, and had a wealth of information that was just fascinating: stories of war battles, how to use a knife, wilderness survival tips, how to tie knots, famous stories and poems, history, numbers and counting… the whole thing was geared to present useful information in a way that was captivating to the average student. I mean – all the sections were interesting to read. A motivated kid who learned to read could absorb the entire thing without a schoolmarm assigning homework. Compare with the textbooks kids have to deal with today: dry and boring, it makes learning so tedious and difficult that most high school graduates can barely read and associate learning with pain. That’s so true, I’ve been ranting about how boring school material has become. Also note how they release jumbled ‘new editions’ forcing students to buy new instead of used books. Compare quality of explanation to the ‘readers’ you mention, Asimov or any motivated hacker blog and wonder why this is not addressed more often. My first electronics-specific book was from 1950’s, a translation from Russian. I learned from it all about protons, electrons, vacuum tubes, those new inventions, called semiconductors, and who was Lenin. There were some interesting stories about, for example, how Nazis used directional transmitters to direct their bombers over Great Britain, and how the British retransmitted those signals back to confuse the enemy pilots. One thing they missed in their predictions is that giving commands, whether by voice or by press of a button, is still work. I believe it’s used to store the axis positions, so the machine doesn’t lose position in a power failure. Since some machines, after being built and fixtured, can’t hit their homing switches anymore, this turns out to be very important. Bubble ram are very closely related to CCD camera sensors, which are still superior to CMOS in most senses except in price. CCD based cameras can be built with an elongated sensor chip which has half the frame physically covered, so you expose one half of the sensor and then strobe the bucket brigade to very rapidly shift the recorded image into the covered half, after which you can strobe it out more slowly to your ADC. This has the effect of reducing the rolling shutter effect prevalent in CMOS sensors which have to be read out pixel by pixel and line by line: you effectively capture one still frame instead of scanning the view. In old style TV cameras, the CCD was simply strobed out line by line in sync with the television scanning beam, producing a direct analog signal. Also, because of the different style in which a CCD is read out, you have more time to measure the charge stored in each cell and you get greater dynamic range and less noise compared to CMOS sensors. Unfortunately, due to CMOS winning out in the price competition (due to smaller chip area), you can’t find consumer grade cameras with CCD sensors anymore, and the professional market is mostly CMOS now as well. The result is poor low-light performance and weebly-wobbly video recording. That’s why old digital cameras from the turn of the century tend to produce better looking images than newer CMOS cameras, despite the much higher resolution of the newer ones. The older cameras often have larger, glass lenses that also help make for better pictures. 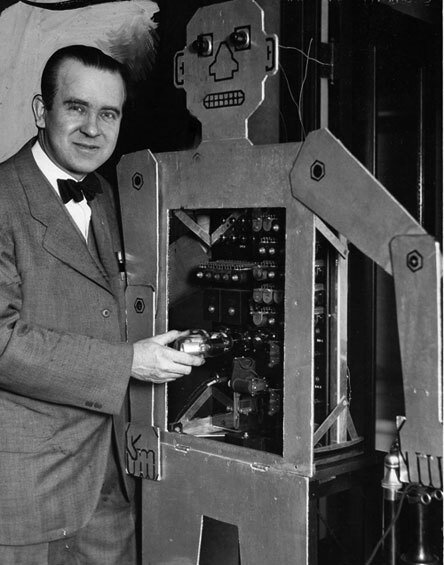 The book “Robots of Westinghouse: 1924 – Today” by Scott Schaut goes into great detail about Willie Vocalite, Televox, and Elektro. It seems to be out of print, but you might find it at a library somewhere. 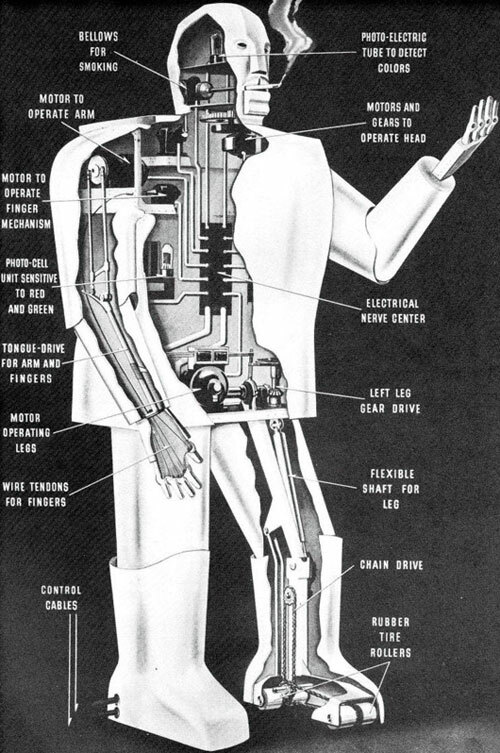 To be honest, it’s not all that well written and needed an editor (“sensor” is spelled “censor”, for example), but it’s bursting with more technical details about the Westinghouse robots than any other reference I’ve seen. Check out the story “A Logic Named Joe” some time. It talks about a thing called a “logic” that was in everyone’s home, and could be used to call up information from anywhere in the world and otherwise do computing tasks for the family. With the exception of the plotline (one of the logica achieves sentience), it’s a remarkable prediction of the internet we have today – in 1946. WHAT?! I read a logic named joe, and I thought it was more or less contemporary sci-fi. Very impressive. I have a 1905 version of such an all in one. It’s filled with frighteningly stuffy manners and etiquette sections and the latest in flight, science, and industry. It’s on to the Wrights and Alberto Santos Dumont. But the 10 year old copied view of “warfare of the future” is a hoot, with bat-winged infantry flying around a classic star shaped fort defended with cannon and a sky full of balloons. Bender learned his bad habits from his grandfather. – very interesting link – thank you! It’s a good thing Westinghouse didn’t team up with Bell Labs, who demonstrated their Voder at the 1939 fair. Combine those two with a wire recorder and the world may have ‘benefited’ from automated voice mail and literal robo-calls 60~70 years sooner. Propaganda is still alive, some countries are just more used to it than others, and don’t notice it as much.